The waiting time to a kidney transplant has dropped by 18% over the past five years, NHS Blood and Transplant has announced, to mark World Kidney Day, Thursday March 9. Kidney patients still make up the majority of the patients on the transplant waiting list and the majority of the people who die waiting for a transplant die waiting for a kidney. Jade Carr, 23, from Widnes in Cheshire, has spent four years in need of a kidney transplant. Her poor health means she is not currently on the waiting list because she would be unlikely to recover from the operation. 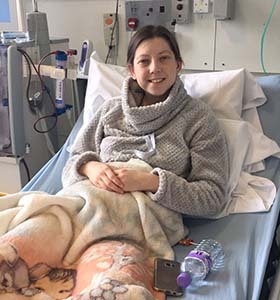 Jade had a heart transplant as a three-year-old and went on to win medals in the World Transplant Games but her immunosuppressants have damaged her kidney function. She is now seriously ill and largely housebound. Jade said: “A transplant would give me back that chance at life, and some kind of normality. I am out of hope with family members being able to donate to me. My mum can’t because of her heart condition and my dad isn’t a match for my blood group. The majority of deceased donors who are able to donate their organs for life saving transplants are able to donate their kidneys. Kidneys can often be donated even when it is not possible to donate other organs. Jamie Madden, a mechanic and electrician from Sandhurst in Berkshire died in June 2015 aged 32 and was able to donate his kidneys. He was working on a friend’s car when the axle stand gave way and the car collapsed on him. His wife Hannah found Jamie under the car on their driveway. “I was just faced with the shock of losing my husband, and my initial thought was ‘you are not touching him’,” said Hannah, 35, a childminder. After the donation, Hannah and her two children received letters telling them Jamie’s kidneys had been successfully transplanted. Around a third of all people waiting for a kidney transplant are from black and Asian communities. People from these communities have a higher incidence of conditions such as diabetes, making them more likely to need a kidney transplant. People from the same ethnic background are more likely to be a match. Diljit Kaur Sambhi, 60, from Darlington, had a kidney transplant in 2013. She first started feeling ill when she began constantly vomiting a green fluid. Doctors think her kidney failure was probably down to an infection combined with undiagnosed diabetes. Her daughter Am Sambhi, 34, said: “We knew we might never receive that phone call. Finding a match can be difficult and being from an ethnic group makes it more difficult. “It was truly unbelievable to get the call at 5am for the transplant and that moment will stay with me forever. “Before we left for the hospital we went to our temple, the Gudwara, to give thanks for this amazing miracle. No words can describe the difference my mum’s donor has made to all of our lives. Join the NHS Organ Donor Register today. And tell your loved ones that you want them to support you donating if you can help others when you die – don’t leave anyone in any doubt about your decision. (1) Median waiting time to kidney only transplant in the UK for patients registered 1 April 2004 to March 31 2008 was 1,153 days. Median waiting time to kidney only transplant in the UK for patients registered 1 April 2009 to March 31 2013 was 944 days. (2) NHSBT records show 411 patients died on the active waiting list for a transplant between March 10 2016 and March 2 2017, or within one year of removal, and of these, 256 people were waiting for a kidney, or a kidney and another organ. There is a particular need for more black and Asian organ donors. Patients from Black, Asian and Minority Ethnic (BAME) communities are over-represented on the transplant waiting list. More than a quarter (26%) of those on the waiting list are Black, Asian or Minority Ethnic while a 1/3 of people on the kidney waiting list are from these communities. People from Black and Asian communities have a higher incidence of conditions such as diabetes and certain forms of hepatitis, making them more likely to need a transplant. Black, Asian and Minority Ethnic patients make up a third of the active kidney transplant waiting list. Although some are able to receive a transplant from a white donor, for many the best match will come from a donor from the same ethnic background. Black, Asian and Minority Ethnic donors are needed to improve the chances of these patients getting the kidney transplant they need.